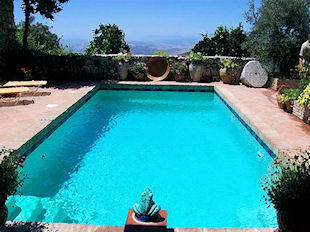 The irregular shaped infinity pool was designed by Sarah for a 'Cortijo' country house near Gaucin. The interior of the pool is rendered in an off-white finish to give a natural colour to the water. 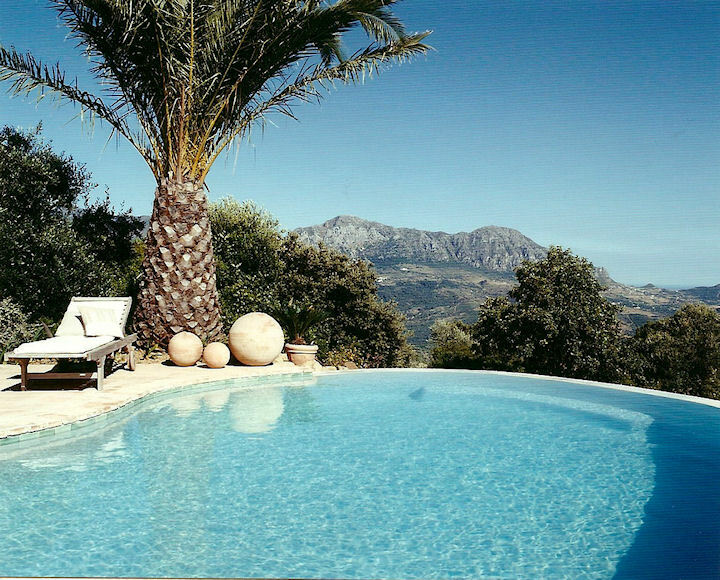 The 10 year old palm tree from a local palm nursery was craned into position after the pool was built and gives an evocative framework for the spectacular view to the Sierra Crestellina mountain with the Mediterranean sea beyond. The pool house covered area designed by Sarah has a cane and beamed pergola which provides welcome shade for sitting by the swimming pool. 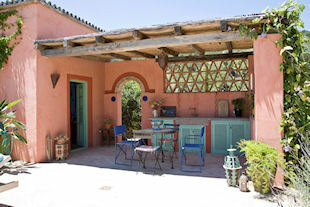 The grey polished plaster bar counter top, with small fridge concealed behind the turquoise painted lattice work doors, has set into it, for washing glasses, an old stone sink found in an architectural salvage yard near Ronda. 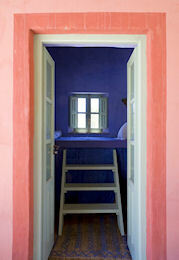 A small siesta area and changing room is off to the left. 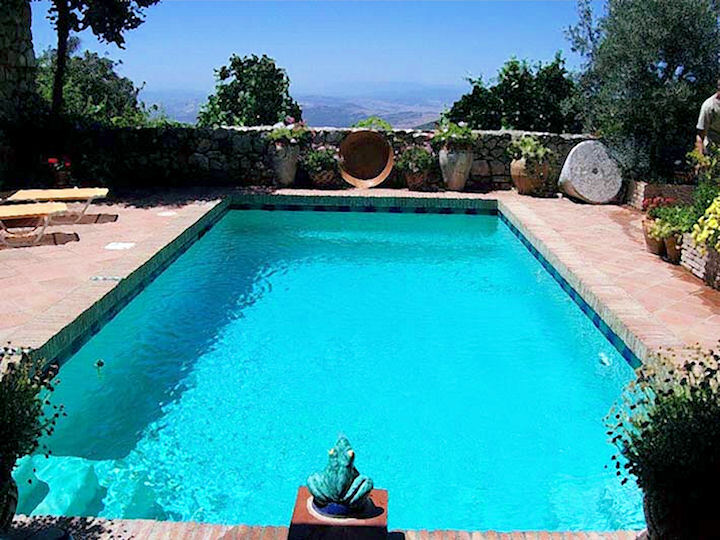 The shaped pool with internal steps leading into it is within easy distance of the curving steps up to this country 'Cortijo', built and designed 4 years ago by Sarah as her home. Existing indigenous shrubs and rocks were incorporated by her into the landscaping of the area around the house terrace and pool area creating a very naturalistic and harmonious feeling. 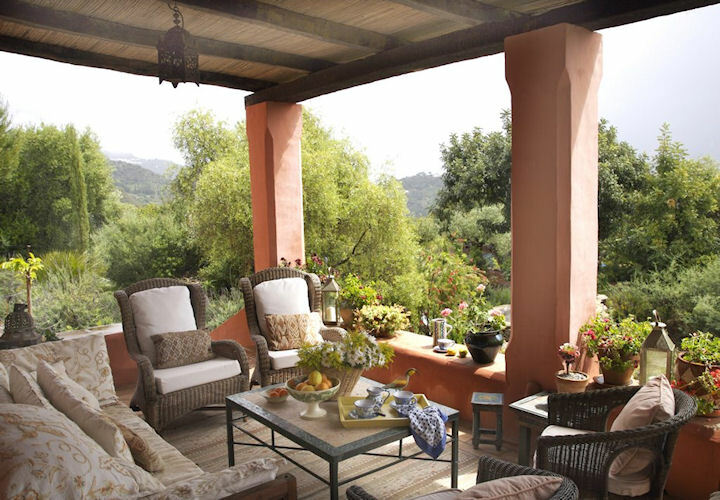 The south facing terrace of this country house looking toward the village of Gaucin has a comfortable all year round seating area furnished with a mixture of cane armchairs with soft cushions set around a Moroccan 'zellige' low table that Sarah had made in Tangiers, where she also bought the kelim rug which brings it all together. 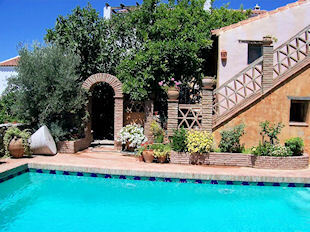 The original 'Corral' or yard where chickens used to roam outside an old village olive mill was dug up by hand and the earth carted out by donkey to create a dramatic and private pool area designed by Sarah who also found the frog fountain and the green and blue waterline tiles in Seville. 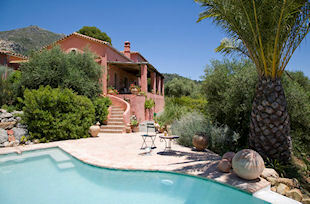 The pool was painted in turquoise-green to give it it's intense colour and handmade bricks used as edging. The old granite olive -crushing stone lies next to a huge clay jar once used for storing olive oil and now filled with geraniums. A staircase leads down to the pool from the living area's terrace above a 17th century olive mill converted into an impressive village house by Sarah ten years ago. The balustrade is a traditional Andaluz design made with local clay bricks which are also used to make raised flower beds and an arch leading into another part of the garden with a huge old fig tree. The raised daybed, piled with cushions, is a cool spot in the pool house for afternoon siestas and also a changing room. 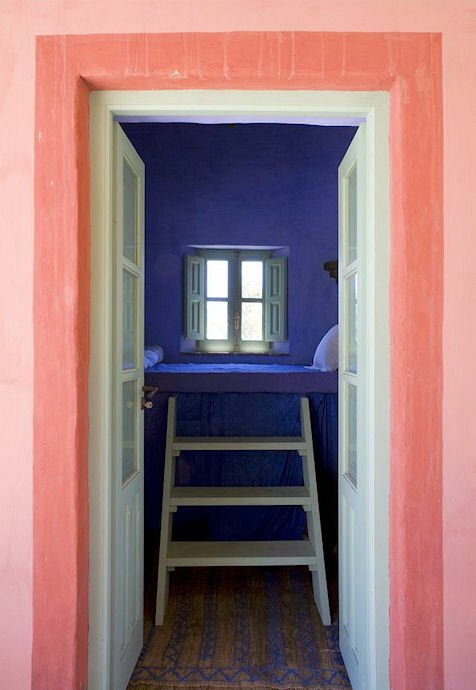 The intense blue of the walls is created with Moroccan pigments mixed with limewash as are the two terracotta bands surrounding the door.